The southern end of Yellowstone National Park is seen at the Lewis River and Lewis Falls in Wyoming on July 12, 2018. As the United States undertakes an unprecedented elimination of protected areas, Canada and Mexico are emerging as North America’s leaders in the conservation of lands and oceans. Unfortunately, the United States is now retreating from its position as a global conservation leader. In December 2017, President Donald Trump announced the elimination of protections for large portions of two national monuments in Utah: Grand Staircase-Escalante and Bears Ears. This action, though likely to be overturned in court, was the largest reduction in land protections in the country’s history.3 Soon after, Congress ordered that the coastal plain of Alaska’s pristine Arctic National Wildlife Refuge be auctioned off for oil and gas drilling for the first time in its 40-year history.4 Weeks later, in January 2018, Secretary of the Interior Ryan Zinke approved a plan to build a road straight through the previously wild Izembek National Wildlife Refuge, also located in Alaska.5 Altogether, these actions have eliminated protections for more than 3 million acres of previously conserved lands—an area 1.5 times the size of Yellowstone National Park. The following sections examine these trends for both public and private lands conservation, as well as oceans protections. The result is a first-of-its-kind analysis of how protections have changed in North America. The data show that all three countries have made strides in different aspects of conservation, but they also reveal the challenges that remain for each country to meet agreed targets and better protect nature. Protecting lands and oceans is important to the future of both natural systems and society. 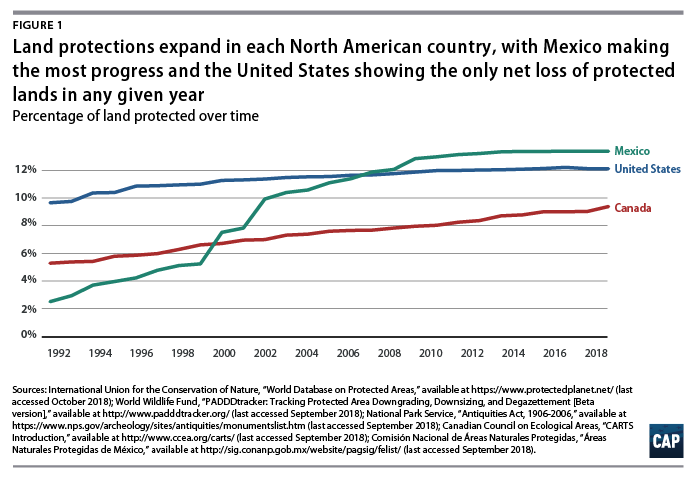 While Mexico and Canada have taken promising steps toward better stewardship, the United States has seen an overall reduction in protected areas since 2017. If this trend continues, it places the future of American wildlife in dire straits. A detailed methods section can be found at the end of this report. 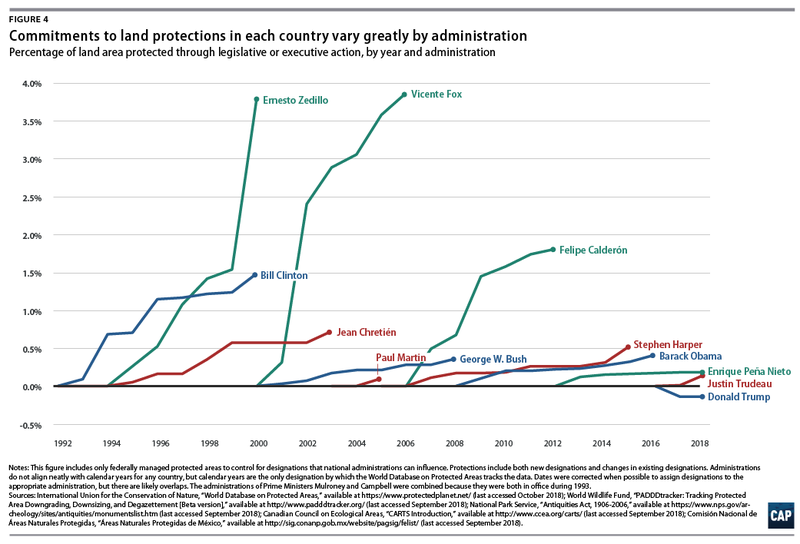 In summary, the authors analyzed trends in protected area designations from 1992 through 2018 in the United States, Canada, and Mexico. The starting point of 1992 was selected because it is the year of the Rio Earth Summit, which represented the start of a new phase of international coordination toward achieving set targets for land and ocean protection. Despite these limitations, the results below paint as clear a picture as possible of how the broad trends in protection of lands and oceans have changed over time. They also provide some explanation about why these patterns are being seen. Aichi Targets: Named for the prefecture in Japan where negotiations occurred, the Aichi Targets are the basis for conservation objectives to be achieved by 2020 by countries that are party to the CBD. Aichi Target 11 addresses protected areas, including protecting 17 percent of land area and 10 percent of ocean area in each country party to the CBD by 2020. Protected area downgrading, downsizing, and degazettement (PADDD): There are several ways that protections can be reduced for lands and oceans. The authors use the same terminology as researchers involved in the development of the PADDD database.23 Downgrading refers to reducing the legal restrictions on human activities in a protected area; downsizing is a reduction in the size of a protected area; and degazettement is the legal elimination of an entire protected area. In 1992, of the three largest North American countries, the United States had far and away the greatest extent of land protected, with roughly 10 percent of its total lands under conservation. (see Figure 1) This achievement was the byproduct of a century of leadership and investment in conservation. Canada had approximately 6 percent of its lands protected, and Mexico lagged far behind its neighbors, with roughly 2 percent of its lands under conservation management. Despite this growth, none of the three countries have protected 17 percent of their land—the Aichi Target for 2020. Mexico has made the greatest advancement toward this goal, as it is now nearly 3 percentage points away from the Aichi Target. The United States is unique in that it is the only country of the three largest North American countries to show a net loss in overall protected area in any year. The Trump administration’s 2017 cuts in protections for the Grand Staircase-Escalante and Bears Ears national monuments—which reduced their size by 50 percent and 85 percent, respectively—affected slightly less than 2 million acres of land and, as such, represents the largest reduction in protected areas in the nation’s history.28 Weeks after President Trump announced the reductions for these two Utah monuments, Congress passed tax legislation that also opened up 1.5 million acres of the previously off-limits Arctic National Wildlife Refuge to oil exploration, and Secretary Ryan Zinke agreed to allow a road to be built through the Izembek National Wildlife Refuge, further weakening the integrity of U.S. protected lands. Taken together, these lost or weakened protections affect 3.3 million acres—an area 50 percent larger than Yellowstone National Park. 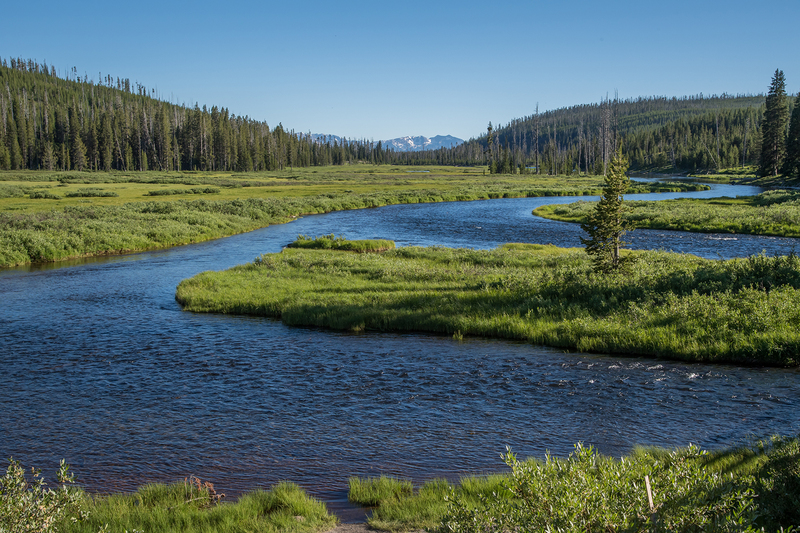 These data reinforce the major opportunities and challenges for land conservation. First, they demonstrate how central public land is to conservation. While some gains have been made in increasing private lands conservation, public lands—especially national parks and forests—anchor large-scale conservation programs, even in areas dominated by private lands. However, in the long term, the bias in protections toward regions with high levels of public land represent a major challenge for effectively protecting ecosystems. Public land is disproportionately distributed in places where the demand for land is lower, often because it is remote, rugged, dry, or some combination of the three. The ecosystems in these places are more likely to receive protection, while habitats in areas that are more conducive to human development are left vulnerable—places such as wetlands, grasslands, rainforests, and deciduous forests.34 Therefore, identifying effective strategies to increase conservation on private lands is urgently needed, and the World Database on Protected Areas data suggest that much remains to be done. It is worth noting that the distribution of these protected waters heavily favors areas outside the continental United States. 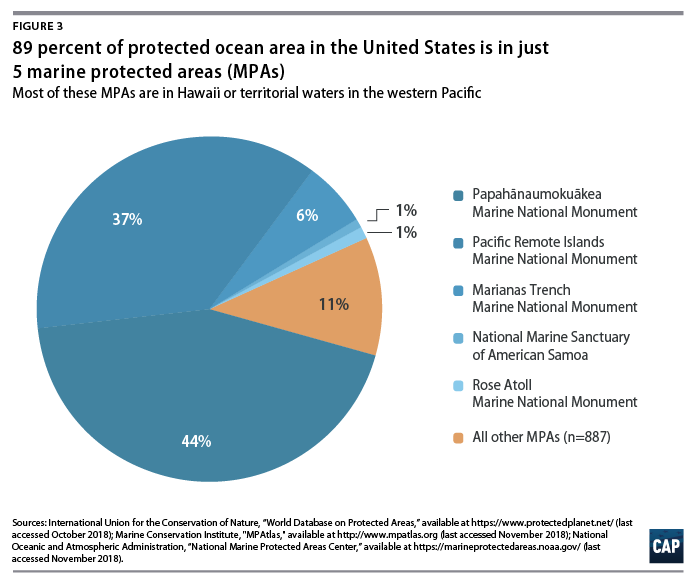 (see Figure 3) More than 40 percent of the overall MPA estate in the United States is in one MPA: the Papahānaumokuākea Marine National Monument in northwestern Hawaii. Another 45 percent is in a handful of national monuments and marine sanctuaries in the western Pacific Ocean. While these are biologically important places, it is worth pointing out that the percentage of protected waters off the West Coast, the Gulf of Mexico, and the East Coast of the United States is much lower despite the unique ecosystems and economic values these waters support. In 1992, Mexico was the leader among the three countries in terms of ocean area under some form of protection. This is notable because of Mexico’s early adoption of this conservation approach, but also because the country does not have the same vast ocean territories as the United States or Canada. While the United States has passed its neighbors in terms of relative area protected, Mexico has maintained its commitment to marine conservation. In addition to older MPAs in the upper Gulf of California and the Colorado River Delta, Mexico has recently designated large areas off the west coast of Baja California and in the Caribbean to protect ecosystems and fisheries.39 This increase in ocean protections has created an opportunity for future investments in management to better conserve the country’s marine resources. Prior to the Trump administration, the rate of land protection in the United States had slowed since the mid-1990s. While the use of executive authority through the Antiquities Act of 1906 has resulted in major new protections in the past two decades for lands and large areas of U.S. oceans—especially around distant islands in the western Pacific Ocean—congressional action to protect land and ocean areas has become less frequent. In the past decade, only three major pieces of successful land protection legislation have passed into law in the United States: the Omnibus Public Land Management Act of 2009, the National Defense Authorization Act (NDAA) for Fiscal Year of 2013, and the 2015 Sawtooth National Recreation Area and Jerry Peak Wilderness Additions Act. 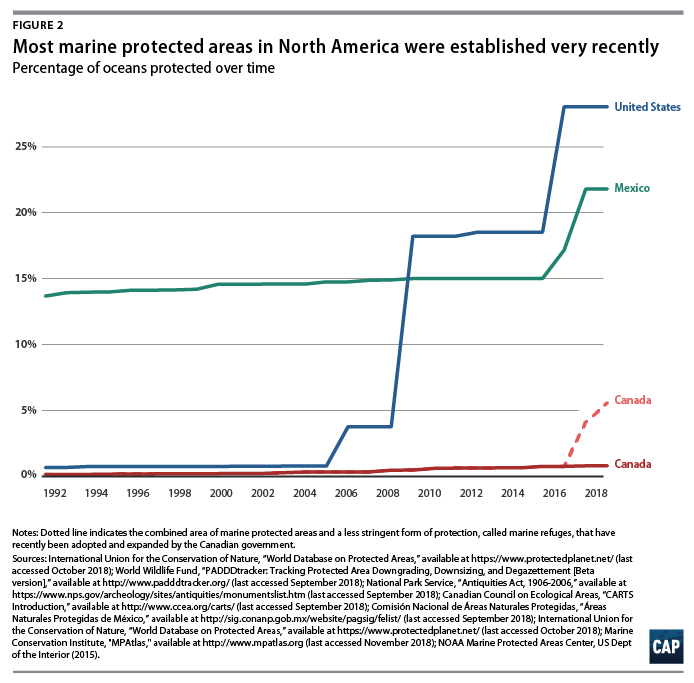 In Canada, the annual rate of expansion of both terrestrial and marine protected area systems has been relatively constant, with the exception of the dramatic uptick in marine protections in the past two years. Although Canada has lower protected area coverage than the United States or Mexico, its push to extend marine protections, invest in greater collaboration with indigenous peoples, and adopt new guidelines for establishing protected areas all should lay the groundwork for growth in the nation’s protected area estate. Protecting lands and oceans is critically important to effective stewardship of wildlife and ecosystems and to the health of our economy and society. The United States has long been a trailblazer in conservation, creating the first national park and leading the way in developing protected area systems and capable public agencies to manage them. However, the data support the concerns that have emerged since the Trump administration announced its plans to shrink Grand Staircase-Escalante and Bears Ears national monuments: The United States has foregone its role as a global leader in land and water conservation. Instead, Canada’s and Mexico’s progress toward their 2020 commitments stand out as examples of conservation leadership in North America. There are other bright spots in the data—including stronger protections for ocean territories within each country. However, most of these designations have only occurred during the past ten years, and it remains to be seen whether this trend continues. Addressing the extinction crisis and meeting international commitments will require continued investment and dedication. Ryan Richards is a senior policy analyst for Public Lands at the Center for American Progress. The author would like to thank Matt Lee-Ashley, Margaret Cooney, Miriam Goldstein, Kate Kelly, and Andrew Edkins for their contributions to this report, as well as Clinton Jenkins and Rachel Golden Kroner for their review of the methodology. Preparing the WDPA data for analysis required several “cleaning” steps. Only protected areas from the three countries included in the study—the United States, Mexico, and Canada—were retained from the full WDPA dataset. Of these, additional protected areas were omitted if they were listed in the database as “unverified” by either a state or an IUCN expert. To minimize repetition and overlaps, entries were also dropped if they described only international recognitions. For example, areas listed under the Ramsar and World Heritage conventions were left out of the data. In addition, protected areas that had been proposed but not officially designated—for instance, due to legal protections that had yet to take effect—were not included. These filters removed 454 entries from the dataset. There were some gaps in the data that needed to be addressed prior to the analysis. Notably, 16,376 protected areas in the United States were missing designation dates, representing almost 50 percent of data entries but a relatively small percentage—less than 1 percent—of the overall area of the U.S. protected area system. Designation dates were added manually for 1,554 entries, using online records from federal and state agencies. Although dates were only added for 9.4 percent of protected areas missing a designation year, these revised entries represented 51 percent of the area that had lacked a designation date—approximately 13 million acres of 25 million acres. National Forest System lands in the United States without wilderness or inventoried roadless area designations have also been omitted from the WDPA dataset.53 However, CAP felt that they merited inclusion given their land management plans, so those designations were added using the USGS PAD-US data. Categorizing protected areas as occurring on public—federal and state—or private lands was accomplished by using groupings derived from the “management authority” variable in the WDPA. The full list of variables included in each category is available from the author upon request. Following these data cleaning steps, trends were calculated using the designation dates, or status year, and the calculated terrestrial areas for each protected area. Data on marine protected areas are still maintained by the WDPA, but debates over appropriate categorizations of protection led CAP to use different definitions than were used for the analysis of terrestrial protected areas. The Marine Conservation Institute, which manages the site MPAtlas.org, has coordinated the development of an MPA-specific set of protection classifications. This includes a standard minimum definition of an MPA and data on whether an area has specific no-take protections.56 These two categories were used for this report. Once the data were cleaned, trends were examined for the designation of both MPAs and no-take reserves for the three countries, using the designation dates, or status year, and the calculated marine area for each protected area.